While enjoying my last weekend in Washington DC, I ran into a police roadblock near the National Mall. Whereas I expected to see the presidential car rush by, instead I saw a colourful parade approaching. People dressed in bright robes and traditional clothing were singing and making music. Young men and women were performing what looked like traditional dances and handing out free food and water to the ever-swelling crowds watching them. Unsure what the reason for the festivities was, I took a closer look at the signs people were holding and that were attached to the floats and was disturbed to discover the real reason behind the ‘parade’. As a result of anti-Muslim sentiments and growing Islamophobia, after 9/11 Sikhs and Sikh places of worship have increasingly fallen victim to hate-crimes. Although Sikhs do not practise Islam but Sikhism, their outer appearance – especially the traditionally worn turban – is often mistakenly associated with Islam and, hence, with one of the perceived driving forces behind terrorism. According to the FBI’s latest report (2014), law enforcement agencies reported 5,479 hate crime incidents involving 6,418 offences to our Uniform Crime Reporting (UCR) Programme in 2014. Although the overall number of reported hate crimes seems to be going down – something that can also be explained by the lack of cooperation from law enforcement agencies in reporting incidents, and the fact that a large portion of victims never report such crimes – anti-Muslim hate-crime incidents are on the rise. Violence and hate crimes against Sikhs is not only present in the United States, but has been reported in Poland and especially in the UK as well. Whereas not all European countries have a large Sikh population, islamophobia and hate crimes against Muslims have been on the rise as well throughout Europe. 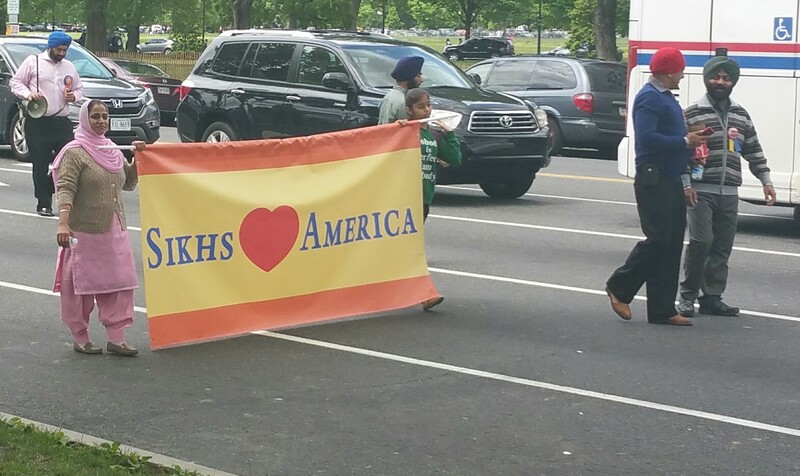 As a result of these increased feelings of hatred and fear, the Sikh community in and around Washington DC not only felt the need to publicly share their beliefs, traditions and values, but also to emphasise that these beliefs and values are in line with American values and – as several banners stated – that ‘Sikhs Love America’. Being aware of the fact that people might not be all that well informed about Sikhism, it makes sense to want to educate people about the roots and core concepts of this religion. Yet, whereas the Sikhs were handing out flyers with some basic information on Sikhs and Sikhism in America, the main goal was clearly to ensure that contrary to what part of the general population might think, Sikhs were not out to overthrow American – or Western – society. The example of the Sikh parade in DC can be seen as a form of self surveillance: adopting practices of ‘checking’ and ‘hushing’ one’s actions to demonstrate one’s ‘safeness’ and/or to reduce the possibility of experiencing racially motivated victimisation. Other forms of self-surveillance are Muslims, Sikhs or other (religious or ethnic) minorities intentionally not wearing traditional clothing or ordering traditional food. The example of the Sikhs in DC shows that in times of terror, security for some may well come at the expense of the security of ‘others’, leading to the configuration of a state of partial securities. For the fortunate ‘us’ that match the profile of the ‘safe identity’, security is granted. For ‘them’, the ‘others’ whose identities are designated as risky, the possibility of safety and protection diminishes. As the music faded away, I was left standing on the sidewalk feeling rather startled. I was stuck by the irony of seeing this ‘parade’ right amidst the various memorials remembering World War II, the Vietnam War and the Korean War aimed at reminding passers-by that ‘Freedom is not Free’. The latter was made painfully clear, not by the memorials but by the Sikhs: in order to be deserving of freedom and to practise freedom of religion in times of terror, you apparently need to actively advertise that you are worthy of it. So besides a state of partial securities, there also seems to be a state of partial freedoms. While standing on the footsteps of the Lincoln memorial, where Dr. Martin Luther King held his famous speech, I realised that under the siege of (the fear of) terrorism, the reality in many Western countries could not be further removed from the dream that he envisioned.